The image is from an engineering version of the product, not released yet. 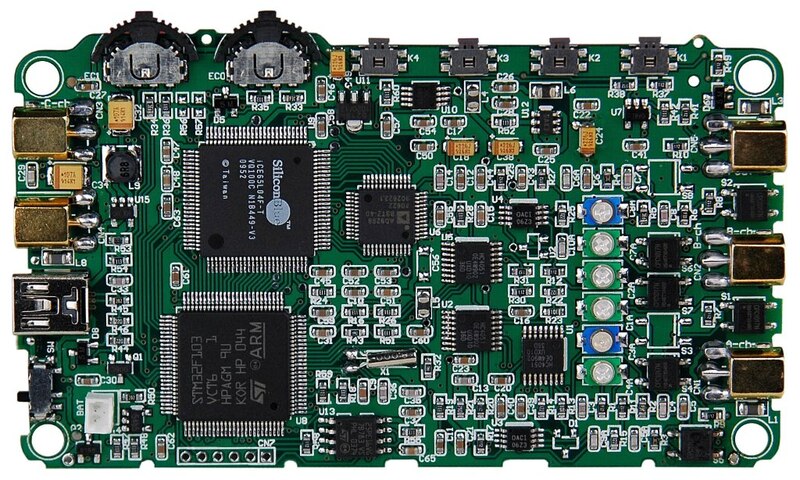 Having spent a fair amount of time recently learning some FPGA programming I'm going to have a go at building a homebrew version of this DSO for my own learning purposes. The product they call DSO-203 which is a quad channel portable DSO. 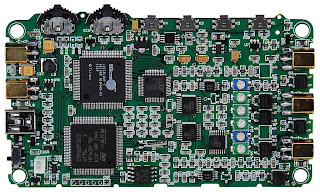 They have used an FPGA that is not readily available through my 'normal vendors' but it is available and it is a low power portable device and as the FPGA source is available it sort of makes sense. The front end uses AD9822 8 bit AD so the resolution is 4096 bits, there is a 10 bit version available so might investigate that too. the band width is claimed at 36MHz which looks reasonable. The reason why I looked is I am in Cambridge and so are ARM and just over a mile away and I picked up a flyer recently about ARM chips and thought I would have a bash at something bit more complex. No idea how long this might take but the SMT pad layout is available as are some decent high resolution images as well as the schematic so this might be a fun hardware build.